Please note that an addendum was issued in February 2018 for this publication, it is available for download and present in both the sample pages and the full PDF. This publication specifies minimum laboratory performance, mechanical requirements and qualification test procedures for filter/water separators for use in systems that handle aviation fuel (jet fuel or aviation gasoline) at any point in the supply chain. It is applicable to filter/water separators intended for use in commercial jet fuel or aviation gasoline (defined as Category C), military jet fuel (defined as Category M) and military jet fuel containing an additive used to enhance thermal stability (defined as Category M100). The main revisions incorporated into the 6th edition of EI 1581 include a new Type S-M filter/water separator, systems that utilise filter/coalescer elements with nominal diameters of 50 mm (2 in.) and 100 mm (4 in. ), a new section providing management of change/requalification requirements, and the option for the base fuel used for testing to be any kerosine-based jet fuel (agreed by the purchaser). Requirements for FWS vessels and vessel accessories have been replaced by reference to EI 1596 and compatibility test protocols have been replaced by reference to EI 1589. 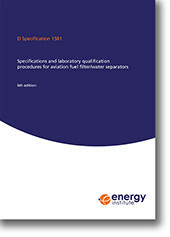 The qualification testing requirements that were included in the 5th edition of EI 1581 have not been significantly amended in this 6th edition. Therefore existing qualifications to 5th edition are recognised as also meeting the requirements of this 6th edition. This read-across from the 5th to 6th editions applies only to the category tested.